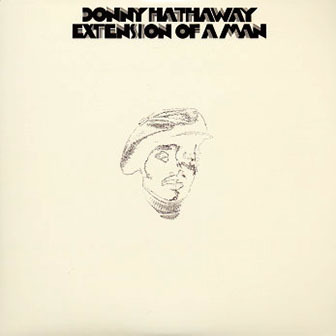 Ranging from inner-city soul to orchestral grandeur to a bluesy ballad to easy-listening pleasantries, Extension of a Man was Donny Hathaway's most ambitious LP, the justly titled capstone to his phenomenal career. Coming, however, from one of soul music's most widely talented figures, this wasn't exactly a surprise; both of his previous studio full-lengths, Everything Is Everything and Donny Hathaway, treated soul as merely a starting point to express his multitude of ideas concerning music and arrangement, song and performance. On Extension of a Man, the ambition began and peaked with the opener, a six-minute orchestral piece titled "I Love the Lord; He Heard My Cry, Pts. 1-2." Arranged and orchestrated for 45 musicians by Hathaway himself, it applied the buoyant optimism of Gershwin's Rhapsody in Blue to a religious context, and segued smoothly into the transcendent "Someday We'll All Be Free," one of Hathaway's most beloved songs. The next two pieces, "Flying Easy" and "Valdez in the Country," were also Hathaway originals, first recorded during the late '60s as part of Chess studio groups; the first is a piece of pop-soul fluff lifted up by his superb reading, the second a smooth jazz-fusion jam with Hathaway illustrating on electric piano his excellent improv capabilities. "Love, Love, Love" and "Come Little Children" were the charting singles, the former a sublime love song heavily influenced by Marvin Gaye's What's Going On. Unfortunately, these disparate pieces, brilliant as they are, don't coalesce into a single work as well as on his masterpiece Everything Is Everything, but Hathaway never stops impressing with his conceptions of arrangement and performance. Crippled by depression, he would never release another solo album during the last five years of his life, though among the projects he'd hoped to record was the four-part concerto Life, to be performed by the Boston Pops Symphony Orchestra with him in the conductor's chair, and the score of an epic biblical film. — John Bush.